Filippa Fleming, a noblewoman in the thrall of her brothers. Klaus Fleming has gone down in Finnish history as the man who put down the late-16th century peasant uprising known as the Cudgel War, but who recalls his delicate but very feisty sister Filippa? Filippa grows up under the thumb of two strong-willed brothers, Klaus and Joakim. At her inherited estate in Yläne, Filippa can be the lady of the manor, ruling over a small army of servants and tenant farmers. She manages a large herd of cattle, breeds Friesian draught horses, and uses her own seal to underscore her orders. But Filippa’s sway does not extend to her own life. Under 16th century law and practice, Klaus is his sister’s legal guardian and can make the big decisions on her future. 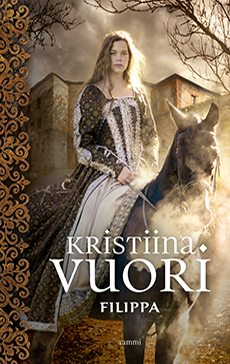 Why does Klaus deny his sister the right to marry her chosen betrothed? Is the brother afraid of what will happen to the family lands and property? Or is there some other motive, something altogether more ominous?